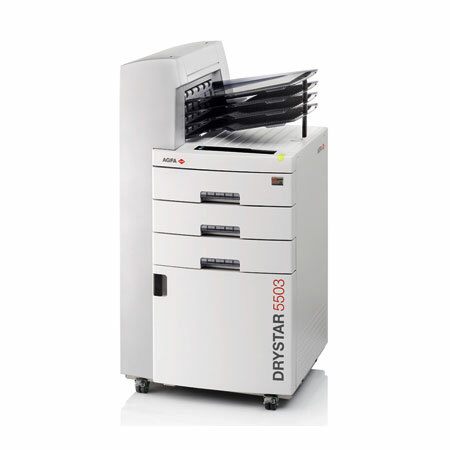 By bringing together a diversity of modalities within an appropriate user-friendly integration – sharp high resolution imaging, state-of-the-art technology, excellent media and maximum user-friendliness – DRYSTAR 5503 is well equipped to serve the multiple demands of a busy department. Offering high throughput of up to 100 14 x 17” sheets/hour, unique multi-format architecture and sorting by modality function, DRYSTAR 5503 is a versatile partner capable of handling a diversity of printing tasks from different sources with speed and reliability. The Direct Digital Imaging technology employed by DRYSTAR 5503 is not only fast, clean and environmentally friendly, it is also one of the best ways of translating the high-resolution capability of 508 ppi at a spot size of 50μm to a final image. Agfa HealthCare’s Direct Digital Imaging technology performs well beyond current industry standards, ensuring that every pixel in the image is fully software controlled for virtually flawless and consistent image quality. A significant reduction in wear and tear is due to an equally significant reduction in moving parts as a result of using Direct Digital Imaging technology.